The Ford Transit Connect has proved itself to be an extremely versatile vehicle, and this latest adaptation makes perfect sense: Taxi use. 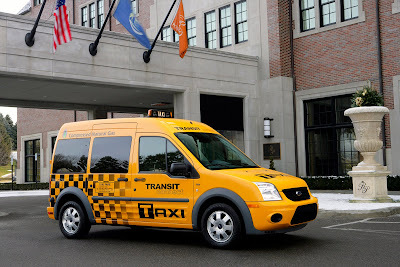 The Ford Transit Connect Taxi will be available in late 2010 as a 2011 model, and will be offered with the standard 2.0-liter gasoline engine. Ford will also offer conversion kits to run the vehicle on compressed natural gas (CNG) kit or liquefied petroleum gas (LPG). These two fuels are popular among taxi operators due to their low cost of ownership. The Transit Connect Taxi also features a wiring upfit package with a hole in the roof for signage, vinyl front and rear seats, rubber rear floor, sliding second-row windows and standard third-row windows—all of which are factory installed. Additional installation of technology and other taxi modifications such as roof signage and the optional seating partition are handled by taxi upfitters in local markets. 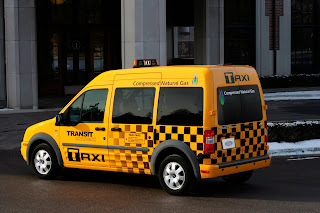 The Transit Connect Taxi idea is a no-brainer since the vehicle has great cargo hauling ability and fuel efficiency. 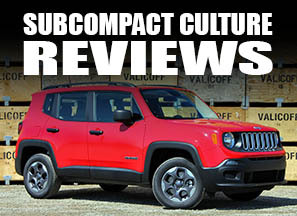 Plus, way more headroom than a Crown Victoria. Gotta go; the meter's running.